In 2006, the artist Alberto Aguilar decided to let go of his studio. "I don't like things that throw off being free," he says. "And not having a studio is, for me, being very free, to not have to make things in that designated space. To think of any of these spaces as a place to make things." Aguilar makes work everywhere—while teaching art classes, during road trips with his family, while commuting to his job. He embodies the idea of living life like a work of art. He believes that art "results from the activities of creative people moving through life," that an activity becomes art simply by naming it so. For his "Domestic Monuments" series, the artist creates temporary installations using household objects. In one, a tubular glowing lamp runs horizontally through the open backs of four chairs. In the "Indiscreet Line" series, objects found in the streets of Havana, Cuba, were arranged in lines, photographed, and then left to live out their fates as ephemeral public artworks. The resulting documentation—of fallen pink flower petals in a public square or tree pods running down the middle of a sidewalk—are stunning in their simplicity. Aguilar, now 45, wasn't always the sort of artist who made conceptual or performative work. Tall and lanky, with close-cropped brown hair, he began his career as a traditional painter, inspired by powerhouses like Picasso and Cézanne. But as his life began to include more responsibilities—as a husband, a college professor, and father to four children—he realized that he wanted a simplified creative practice. The dissolution of his studio came around the time he started working full time as a studio art professor at Harold Washington College. He resigned from that job in 2018: after 12 years, he was ready for new challenges. (He now adjuncts at UIC and the School of the Art Institute and makes art.) The period from the end of the studio practice until his resignation serves as a rough framework for "moves on human scale," his upcoming solo exhibition at Gallery 400. 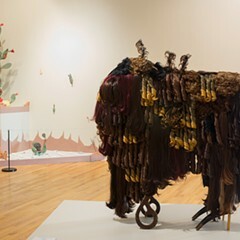 Lorelei Stewart, the gallery's director, says she was immediately excited about the prospect of showing Aguilar's work. "Presenting Alberto's work is such a pleasure because it's so searching and inquisitive," she says. "It's everydayness is deeply accessible, in a way, as to almost efface its creativity. But that's where something more profound is at work, I'd say. At its heart, there's a democratic ethos embedded in his work. In the process of recognizing, even identifying with, Alberto's familiar materials and methods, we viewers access the possibility of our radical everyday imaginations, not because Alberto's work is easy but because it proposes that creative capacities are in all of us." Aguilar grew up in Cicero, where his parents owned a small grocery store called La Grande. After school, Aguilar and his siblings (three brothers and one sister) would walk there and hang out in the back. His mother cooked dinner for them in the deli. Then, once his father arrived at the store from his first job, he would take over and his mother would walk them home. "At the store, I remember we used to take this butcher paper, and we used to roll out a big sheet and we would just draw on there," Aguilar says. "We always drew, especially my brother who's a couple years older than I am. Him and I were really good at drawing. But he was better, because he would draw without hesitation, and my drawing was always more like scratchy lines." He remembers this period as a happy time. The family was close, taking frequent road trips to Florida or Mexico, where his parents are from. "It was happy up until the point where I realized we all kind of grew apart, when I was still in high school," he says. It was also in high school, at Glenbard East, that Aguilar became seriously interested in making art. He came to it in a roundabout way. "I was really into mind-altering substances," he says. "And I think that I was into it because of what it gave me, like, the access that it gave me to seeing things in such a different kind of way. And for how it allowed me to see how strange life really was." But then one day, while high, he had a negative experience that changed his trajectory. He looked up at the sky, and its vast endlessness became overwhelming and frightening. After that he stopped using drugs. He decided to improve his life and started focusing more on school. He enrolled in a photography class and he excelled at it. But what really interested him was a painting class in the next room. "I would always see all the painters go in and out of the room, and I felt kind of envious," he says. "I felt like I belonged there." Eventually he signed up for painting and was quickly hooked. His senior year he visited the Art Institute of Chicago for the first time. He had never been to an art museum before. "I was looking at paintings, but I started to become curious of the source of what I was looking at," he says. "I wanted to see some of these things in real life." At the museum, he was struck by a highly abstract Cubist portrait by Picasso titled Daniel- Henry Kahnweiler. Kahnweiler, a German art dealer, is depicted in dozens of scattered planes. The muted brown and gray tones of his body blend in with the atmosphere around him. "When I looked at it, it was like alive," Aguilar says. "He left all those forms open, and it looked like these planes were just in constant flux." Aguilar was amazed that a painting made in 1910 could still feel so vibrant. "I think that I made that connection that this was what I was searching for when I did drugs," Aguilar says. "Like I could have that experience outside of doing them. I think that's what artists do, and I was amazed." His high school painting teachers encouraged his pursuit of art. In fact, they submitted an application for him to SAIC—an experience that would shape the rest of his life. Aguilar was a serious student at SAIC, interested mainly in painting and drawing, copying the styles of Picasso and his modernist contemporaries. "I was resistant towards these more conceptual artists," he says. "I was very traditional." The artist Jorge Lucero has been friends with Aguilar since they were in high school. They also attended SAIC at the same time, where at one point they shared a studio. "We spent a lot of time working alongside each other and staying up drawing," Lucero says. He recalls Aguilar as always "totally serious" about his work. "Not unlike how he is now: dedicated." The painter Clintel Steed, who also attended undergrad with Aguilar, agrees. "He's always challenged himself," Steed says. He recalls one time when the school organized a first-come, first-served trip to Italy. "We stayed there all night waiting in line, like it was a concert or something." On the trip, Steed says, a lot of the other students treated it as a vacation. Not Aguilar. He spent his time visiting museums, seeing the classics, and painting. "He's always been a serious dude," Steed says. "It's just a way of looking at life." He compares Aguilar's focus to that of Picasso. "I think that's what people don't get, to be Picasso in the studio. He made like three or four paintings a day. If you're gonna try to somehow stand up to that, then you've got to bring it, you know what I'm saying? You can't be joking around with that. We were all painting hard." "The thing about the Art Institute is that—and I don't know if it's still like this—but, when we were there, there was one part of it that was what the teachers were trying to give you," Lucero explains. "But there was another chunk, and I think it was the predominant part, it was what you could do with your classmates. It was how you taught each other. I think through that, we sort of challenged each other. We were able to egg each other on to even more adventurous areas." When Aguilar was 23, he graduated from SAIC and got married. He and his wife, Sonia, moved to Arizona, where Aguilar's parents had relocated. Aguilar continued to make work and decided to pursue a master's degree. He assumed he would attend Arizona State University, so he didn't apply anywhere else. But then he didn't get in. Depressed, the next year he applied to several other schools. When he was accepted at SAIC, he knew without a doubt that he wanted to go back. "There was just a loneliness that I felt out there, especially in the summertime," he says. "I just wanted to come back to a bigger city. 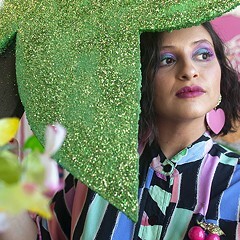 I loved my time at SAIC, and I think that the two years away made me realize how much I loved it." 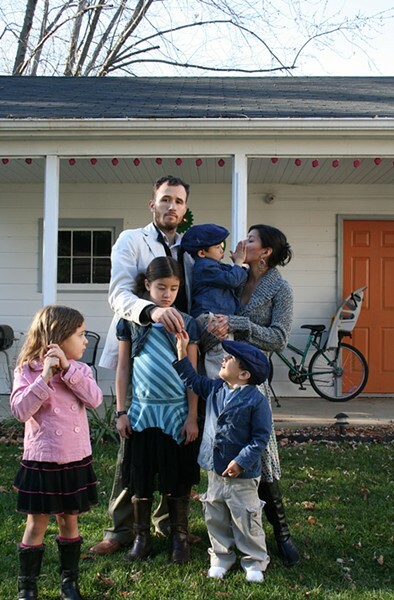 One day in 2012, Aguilar came down the stairs of his Garfield Ridge home to find two of his children, Madeleine and Paolo, hitting a balloon around the living room with handbells. The game was simple: you had to stay in the confined space of the area rug and when the balloon touched the ground, the game was over. Immediately charmed, Aguilar asked for permission to film the game and then joined in. 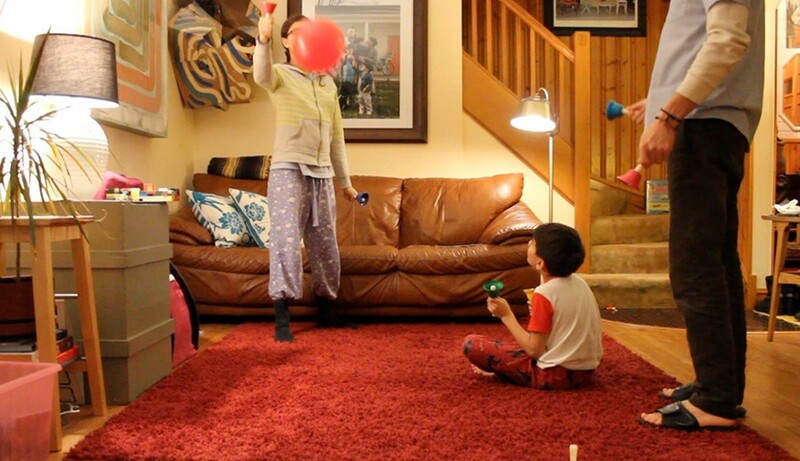 In the resulting video, Aguilar and his pajama-clad kids move around the room, bouncing the red balloon to one another. The handbells, constantly in motion, sound like wind chimes. Their highly resonant tone adds a pleasant atmospheric effect. In the foreground Aguilar's other two children, Isabella and Joaquin, play a computer game. Though offscreen, their voices are clearly heard. Just as the balloon falls to the floor and the game ends, Isabella says the phrase "sensitive equipment." "It was very serendipitous and perfect that that should be the title of the work," Aguilar says. 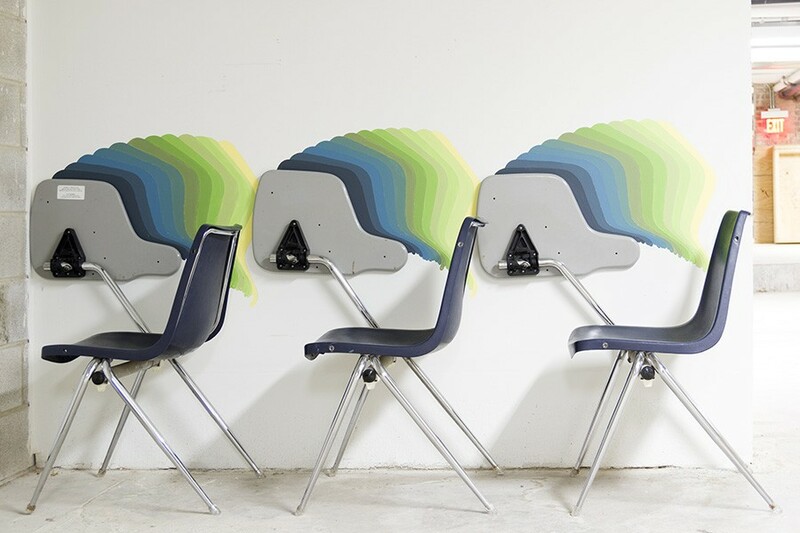 Sensitive Equipment, which was originally displayed at the Museum of Contemporary Art in 2013 as part of Aguilar's installation Home Field Play, will be the centerpiece of the Gallery 400 exhibition. "It encompasses so much of the kind of ethos of his work, and the sense of his coming out of his everyday context, and using very familiar elements to create unfamiliar or even surprising experiences," Stewart says. "It will be very participatory for our visitors. It's in the center of the space, so people can really have access to his process, which I think is such a compelling part of the work that people can identify with. 'This is so inventive and creative, but I also could have done it, but I didn't.'" 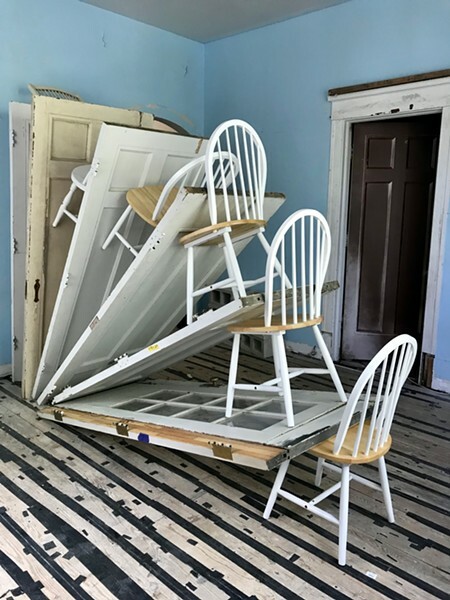 The playful, interactive piece, made collaboratively with his kids during a normal day at home, is a perfect encapsulation of the work in "moves on human scale." There will be selections from his "Sound Conversations" series, recorded conversations between the artist and a collaborator. Often remixed and sometimes set to music, the pieces aren't straightforward dialogue—they are shaped by wordplay and randomness. One moment, the participants might be talking about beards, which leads to talk of beer. Aguilar often repeats a word or phrase, as a way to fill time or bide it, until another idea strikes. Laura Shaeffer, a local curator who now runs the Oak Park domestic gallery Compound Yellow, looks back fondly on past exhibitions and art happenings she's staged with Aguilar. For one event, the two went door-to-door in Hyde Park collecting white objects from residents to be displayed in a defunct library space. At the opening event, all the guests wore white and a chef served an all-white dinner—all Aguilar's idea. "Collaborating with Alberto is kind of like looking through a camera obscura," Shaeffer says. "Everything is flipped upside down and seems foreign, in a delightful and illuminating way. You never know what's coming next or what's going to happen. Working with him makes me feel alive, in all ways." Through his work as a professor over the past 15 years, he has also collaborated frequently with students. In many ways, his teaching is just another extension of his art practice. Joseph Josué Mora, an artist who studied with Aguilar at Harold Washington in 2012, recalls that Aguilar would start every class with a performance. "He'd pull down the projector screen and go behind it," Mora says. "The only thing you could see of him was his legs and then he would just start chanting or singing in a poetic way and talk about time, about how his time was running out. It was very in the moment." Alex Bradley Cohen, also a former Harold Washington student, is one of Aguilar's most frequent collaborators. The two have made videos and sound conversations, performed in variety shows together, and collaborated on multiple installations and exhibitions. When the two met, in 2009, Cohen was treating school casually. A high school dropout, he describes himself at the time as very unfocused. But Aguilar's teaching approach appealed to him. "He's able to meet students where they are and create opportunities for them to learn on their own terms," Cohen says. "He makes the classroom a place in which failure is a possibility for finding truth, or finding correctness. For me, that was amazing because I dropped out of high school. That made learning safe or something." Cohen, who has become good friends with Aguilar, later transferred to SAIC after Aguilar applied on his behalf. He's now pursuing an MFA in painting at Northwestern University. Cohen sees Aguilar as consistent no matter what role he's inhabiting. "I can't separate him, his work, and his teaching practice at all," Cohen says. "For me, it's like what sets his work apart, I think it's just what sets him apart as a person. What sets him apart is the way that he fights for freedom in the world, freedom of expression. He's fearless. That's one thing that he always tried to get me to be as an artist, is fearless." Many of Aguilar's collaborations with his oldest child will also be featured in the exhibition. Madeleine, now 21, is a junior at SAIC, concentrating on print media and fibers. "Moves on human scale" will include autobiographical comics and books she's made about her family. Her presence will also show up in other ways: through background music she composed for the sound pieces, in home-based videos, photographs, and of course through the invention of Sensitive Equipment. The Aguilar family is by all accounts close. Although some family members are less interested in being a part of Aguilar's artwork than others, Madeleine says, they are all used to it, and they all recognize the importance of the work. "There are times when we're doing weird things, in strange poses, or just like standing in a corner and he's taking a picture of us," she says. "There's a lot of humor involved and we acknowledge that in the moment. But there's also a lot of seriousness. Like if he's taking a picture of the dog, you can't call the dog's name because then it's going to ruin everything. So we have to be super careful. Not that he'll get mad, but we know: this is important. This is what he's doing. It is fun, and it is funny a lot of the time, but it's also something that we know is important." For Aguilar, part of the beauty of not having a studio, of creating art out of everyday moments, is the opportunity to capture family moments. "I think that art is a way to document things as they take place, within even my personal history," he says. "I like the power of art to be able to do that." Reflecting on the moment in high school when he realized his family had grown apart fills him with emotion: the inherent sadness of the passage of time, the regret of not enjoying things in the moment. His open approach to making art stems directly from this, as in the piece Pizza Parade. For the ephemeral 2012 work, the Aguilar family walked west on Archer Avenue from Pulaski to Harlem, stopping in each pizza place they encountered and asking for a free slice. Aguilar's youngest son, Joaquin, wore a pizza costume emblazoned with buttons handmade by Madeleine. 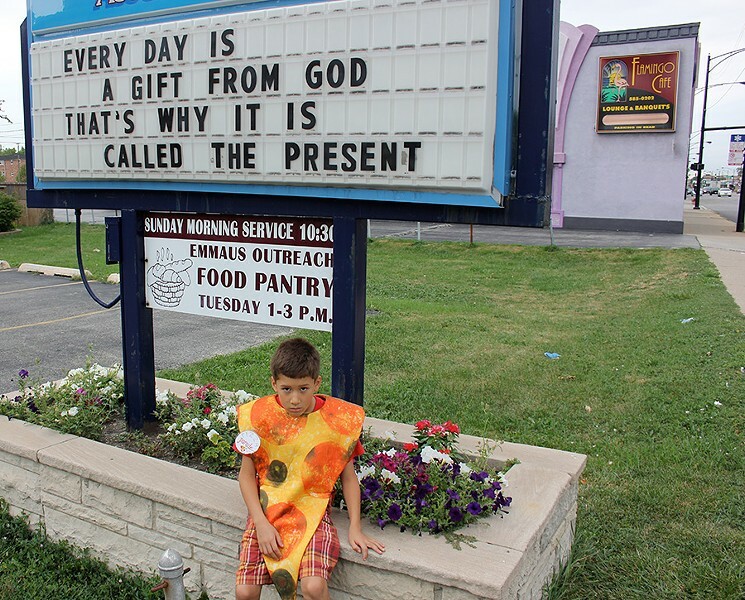 Pizza Parade, which figures prominently in Aguilar family lore, will be represented in the show by the costume, which normally hangs over the stairs at their home, alongside a photo of Joaquin posing unhappily in front of a church. In addition to showing these artifacts in the context of an art show, Aguilar likes for the objects to have significance for his family. "In that picture, my son, he has a grumpy face because he never really liked those kind of things, even as a young kid," he says. "But my hope is that some day, he's going to look at those objects and he's going to realize the significance of them and what they meant in our family history." Madeleine sees her father's approach to life as inherently radical. "I've been to a lot of his lectures, I've performed at a lot of his lectures too, and I've just heard the questions that people have asked him," she says. "And what I've come to understand about what's special about his work is that it's kind of like a different way of living, or a different way of experiencing the world. And it's not really about trying to prove a point, or trying to say something, but it's just a way of living that is able to speak to a wide group of people, which I think is pretty amazing. And I think in a lot of ways, his work and the way that it's entwined in our lives, it challenges the way of the world." Allan Kaprow, the late American artist known for popularizing art "happenings," once wrote, "Playing with everyday life often is just paying attention to what is conventionally hidden." For Aguilar, that sentiment rings particularly true. He looks at the mundanity of everyday life—folding laundry, painting the garage door, lecturing to a class—and sees things with a freshness and a presence that most of us lack. With “Memoria Presente: An Artistic Journey,” the institution proudly and vibrantly celebrates its 30th anniversary.